Cherry Audio announced 2 new modules for popular soft modular synth Voltage today: Poly Quantizer and Poly Stereo Spread. 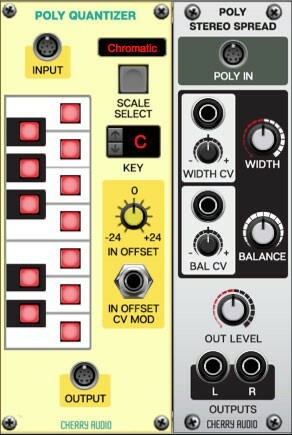 Poly Quantizer is a polyphonic version of the Quantizer module. Features built-in scales to use or create your own custom scales. Poly Stereo Spread is a module designed to automatically pan polyphonic voices around the stereo spectrum. Fantastic when used in conjunction with the Poly Unison module. Replicate stereo panning features of classic polyphonic synthesizers like the Oberheim OB-8, where each voice in a chord could be panned to a different stereo location. The stereo width can be modulated with control voltage, along with the overall stereo balance. Free for Voltage Core Owners, these new modules will automatically appear in the Voltage Modular library.